By default, Harmony will turn off any devices that are not being used as part of the current Activity. 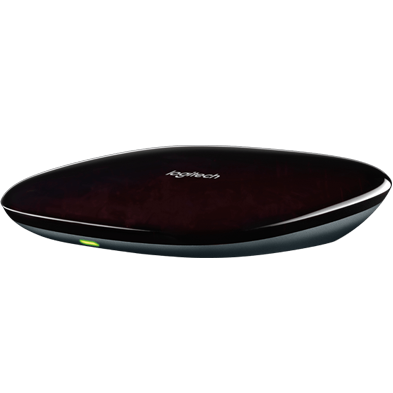 However, Harmony gives you the flexibility to change how it powers on and off your devices. Using the power settings allows you to decided how your devices behave, these settings can be adjusted using the MyHarmony desktop software, or Harmony mobile app. This option will power on a device when starting an Activity that includes it, and power off the device when you stop the Activity. 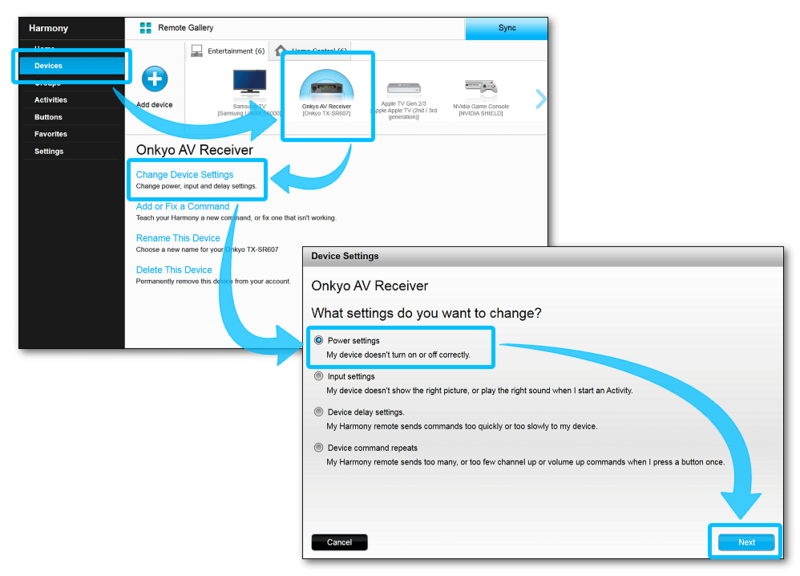 This is most common for televisions or AV receivers that you only want powered on when in use. This option means that Harmony will never send the power on or power off command. 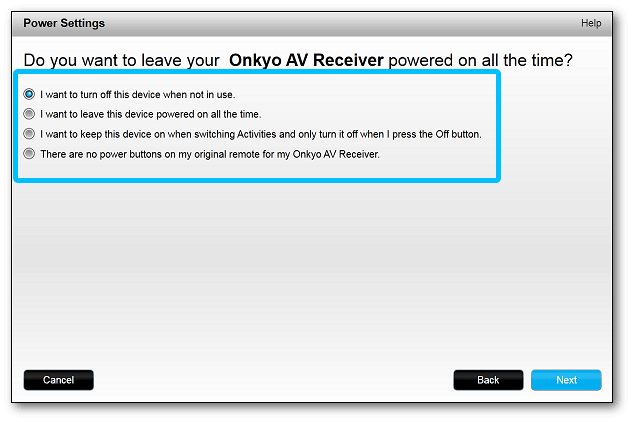 This may be valuable if you have a media center or set top box that you want to leave on all the time. This option will power on the device the first time it is needed, but keep it turned on when you switch from one Activity to the next. 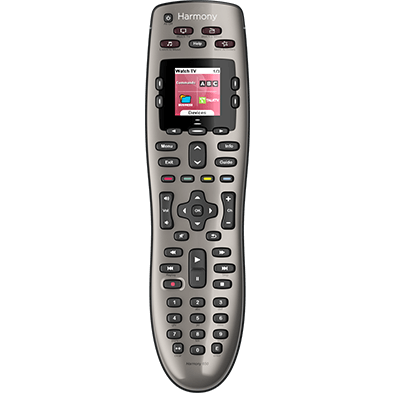 The device will be powered off when you press the Off button on your Harmony remote indicating that you want everything turned off. 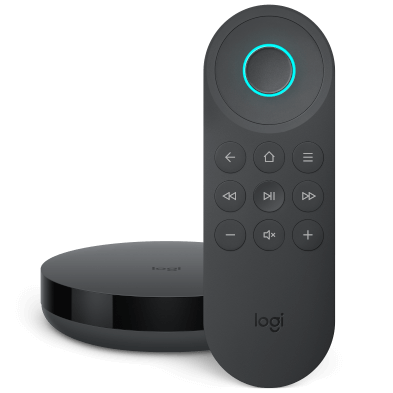 This is useful for game consoles that you may want to pause and leave on when switching to watch TV, and return to later on without having to stop your game. This option should be used for devices that don't have power buttons at all. This is common on older AV equipment that may not have come with a remote control. In order to use the Harmony mobile app, you'll need to use a Harmony hub‑based product. If you're not using a Harmony hub‑based product, please follow the desktop instructions to change your device's power settings. Select the device you'd like to modify, followed by POWER SETTINGS and set your power preference. Follow the on-screen prompts to continue configuring your device. 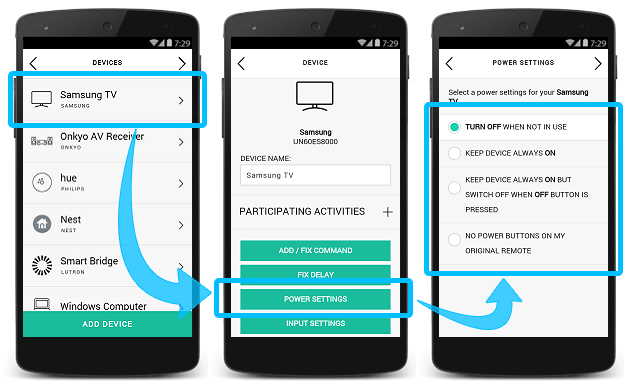 Follow the prompts to finish configuring your device's power settings.